This time of year we see some amazing lilies in the garden. What is not to love – they are so showy with huge trumpet flowers, they are usually vibrant colours, they have a wonderful fragrance in many of the Oriental Lilies. Best of all they can be brought indoors as cut flower – often lasting 2 plus weeks in a vase! 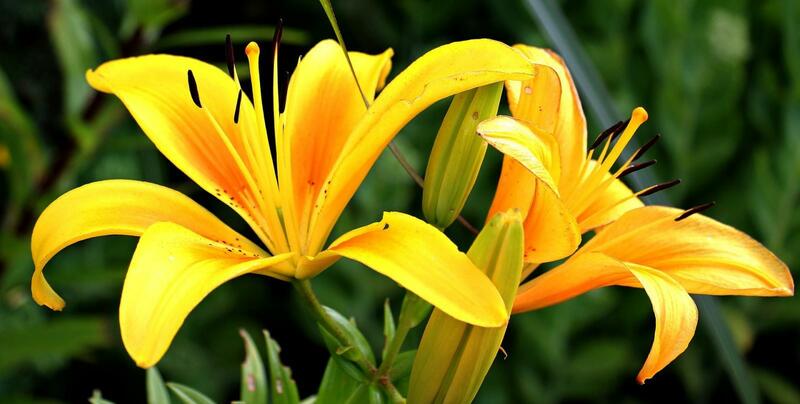 Asiatic and Oriental lilies are the two most popular types of lilies for Ontario gardens. Asiatic lilies are among the easiest to grow. They're very hardy, need no staking, and are not particularly fussy about soil, as long as it drains well. Asiatic lilies are the earliest to bloom and the easiest to grow. Hybrids come in pure white, pinks, vivid yellows, oranges, and reds and heights are from one to six feet. Intense breeding has erased much of the Asiatics' fragrance, but in spite of their lack of perfume, they are a favourite with floral arrangers. Oriental lilies have become increasingly popular, due to their large, exotic blooms and heavy, sweet perfume. This group tends to be taller we usually add plant stakes for support. They can be grown successfully in much of Ontario, provided the soil is organic and acidic with good drainage, and you mulch them heavily each fall. Oriental hybrids bloom in mid- to late summer, just when Asiatic lilies are beginning to fade. Plants range from two-footers to over eight-foot-tall giants – Orientals are always a striking choice and we love that the shorter ones are great for patio beds or container gardens. Known for their intoxicating fragrance that intensifies after dark, Oriental lilies produce masses of huge white, pink, red, or bi-colour blooms. They make wonderful cut flowers that will fill even the largest of rooms with their unique scents. Oriental lilies are typically blooming mid-to-late summer. ‘Stargazer’ is the most well known of the Oriental Lilies and we often see them in flower arrangements. Stargazer types are easy to grow and do best in full sunlight. They have a fast growth rate and should be planted in full sun in well-drained loamy or sandy soil. If you have a clay-based soil make sure you add a lot of compost and organic matter to loosen the clay – lilies do not like wet feet. When mature, Stargazers can grow to a height of 1m with a spread of 15 cm with 4 to 5 flowers per stem. ‘Pink Perfection’ is another fun Oriental Lily for the garden and is taller still – Pink Perfection can get to 2m tall!! Lilies love full sun, as long as, the bulbs are deep enough to keep cool when temperatures soar. Look for a spot in the garden that is the first to dry out after rain. Lilies do not like wet feet. There are so many vibrant colours and varieties to choose from! Stargazer is our most favourite lily (shown in photo above). Find a Landscape Ontario member Garden Centre near you.